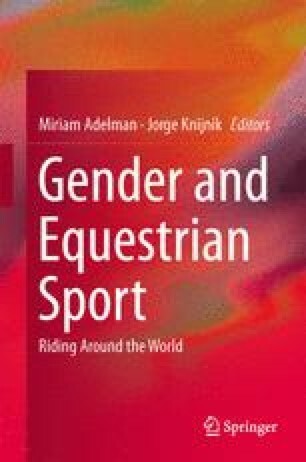 The aim of this chapter is to analyse changing gender and social class patterns in equestrian sports in Sweden and Great Britain during the twentieth century. One hundred years ago, equestrian sports were strongly connected to men and masculinity. Men worked together with and used horses in agriculture, forestry, in the transport sector and in the army. A real man was a ‘horse man’. In Sweden horse riding was connected to the army and to the upper class. In today’s Sweden equestrianism is strongly connected to women, girls and femininity on all levels. Furthermore, the contemporary equestrian sector is of great economic importance to the Swedish economy, and horse riding is popular and not only restricted to members of the upper class. Less is known about the development in Great Britain, despite the fact that Great Britain has since long been seen as a very important place for the development of equestrian sports. In order to understand the process of changing gender codes and the growth of the sector in Sweden and to explore and understand the development in Great Britain in the twentieth century, this chapter examines articles on the equestrian competitions of the Olympic Games in 1912, 1948, 1952, 1956 and 1964 in Swedish and British magazines. Equestrian Statistics. (2011, February 16). Resource document. https://www.bhs.org.uk/About_Us/Equestrian_Statistics.aspx2011-03-20. 2 May 2011. Hedenborg, S. (2007). The Popular Horse: From army and agriculture to leisure. Idrottsforum. November 21, 2007. Resource document. http://www.idrottsforum.org/articles/hedenborg/hedenborg071121.html. Accessed 27 June 2012.